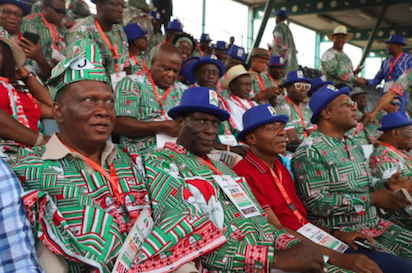 THE Peoples Democratic Party, PDP, yesterday, tasked seven governors elected on the platform of the ruling All Progressives Congress, APC, to face the reality of defeat awaiting them in 2019, stating that their visit to the President, to prevail on him to seek a fresh mandate, was self- serving. In a statement posted on its official Twitter Handle, the party berated Mallam Nasir El-Rufai, Yahaya Bello, Abdullahi Ganduje, Solomon Lalong, Abubakar Bello, Ibrahim Geidam and Jibrilla Bindo, executive governors of Kaduna, Kogi, Kano, Plateau, Niger, Yobe and Adamawa States, respectively, who visited President Muhammadu Buhari, last Friday, asking him to seek a second tenure in 2019. “The visit of Governor El-Rufai and six other governors of the All Progressive Congress (APC), to President Muhammadu Buhari asking him to run for second term is self-serving. “Governor El-Rufai and his cohorts are scared stiff of the “looming disgrace” awaiting them at the 2019 polls, forgetting that President Buhari himself will face an imminent and inevitable electoral defeat too, come 2019. “They are not driven by love for President Buhari or patriotism. They are struggling to save their imminent job loss. But can a drowning man rescue another?” The party asked rhetorically. Apart from Geidam, the governors who are all seeking fresh mandates have by their visit and mission, made it clear that the APC is unlikely to field another Presidential candidate in 2019 unless Buhari declines to run. The post 2019: Looming disgrace awaits you, PDP tells El-Rufai, Bello, Ganduje, others appeared first on Vanguard News.